Wisconsin is getting federal money to help buy new clean energy vehicles. 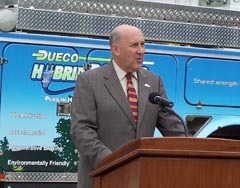 Governor Jim Doyle says the state will receive $15 million in American Recovery and Reinvestment Act funding to replace hundreds of older vehicles with new fuel-efficient models. The money will go towards the purchase of over 500 alternative fuel and advanced technology vehicles, for over 119 communities and businesses across the state. Doyle says the funds will help purchase a wide-range of vehicles, ranging from small electric cars to large utility vehicles. The Governor says replacing existing vehicle fleets with alternative energy options will lead to other costs savings. He estimates the move could conserve over 1.6 million gallons of fuel a year, as older vehicles are taken off the roads. The state is also receiving $1 million in federal funding to help add new bio-fuel retail locations.